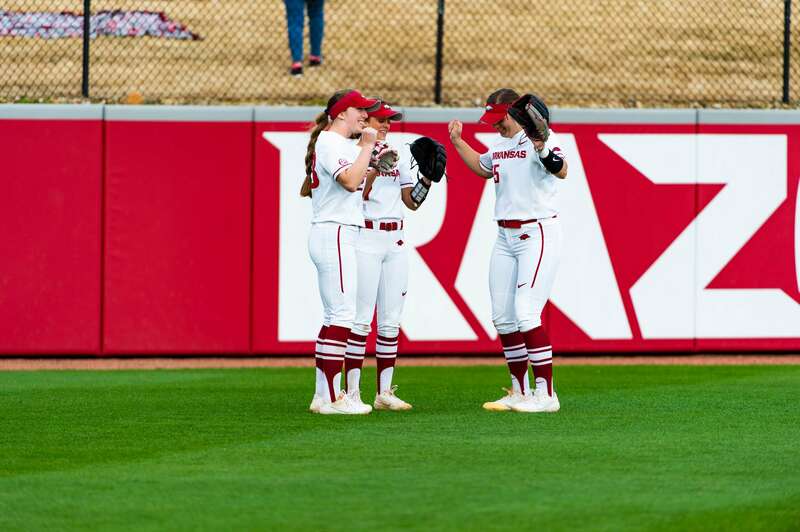 FAYETTEVILLE – The University of Arkansas softball team will play host to Furman University this weekend (April 13-14) for the Razorbacks’ annual Bark in the Park. The Hogs and Paladins are set for a Saturday morning start, with game one of the series to start at 10 a.m. (CT). Games two and three will be played as a doubleheader on Sunday, starting at 10 a.m. (CT) as well. Admission is free for all fans at Bogle Park, but this weekend is special in that all of our two-legged fans are encouraged to bring their four-legged friends for our annual Bark in the Park. The first 50 dogs to make their way into Bogle Park will get a free Razorback tennis ball. Gates open one hour prior to first pitch. The Razorbacks continue their nine-game homestand after a doubleheader sweep of Wichita State on Wednesday (April 10). Arkansas run-ruled the Shockers, 9-1 in game one behind a six-run sixth inning with a game-ending single by Sydney Parr. The Hogs needed only four runs in the third inning to defeat WSU in game two, Katie Warrick hit her eighth home run of the season to score three runs and give Arkansas the lead and the win. Diaz recently surpassed former Razorback and current assistant coach Shana Easley for fourth all-time in career putouts and currently has 1,277 career putouts, 26 away from sliding into 3rd place (1,303). Diaz is only one of two first baseman to surpass the 1,200-career putout mark. Diaz is only three home runs from ranking fourth among Razorbacks for career home runs (has 27, needs 30); her success at the plate also puts her on track to move into second for career RBI (has 126, needs 131), and one sacrifice fly from the number one spot (has 9, needs 10). The 2019 season marks the 10th season in Bogle Park – since its opening, the Hogs have played 248 games inside the park, for a combined 138-110 record. After a tough weekend in Gainesville, the Razorbacks are holding steady in the polls, cruising into Week 9 sitting at 26th in the NCAA Women’s Softball RPI, and ranked #18 by USA Today/NFCA, #17 by Fastpitch News, #22 by Softball America and receiving votes in the USA Softball/ESPN poll. This is the first time the two teams are meeting – Furman is one of four teams that Arkansas is facing for the first time in program history this season (UAPB, Campbell, Furman, Lipscomb). Furman is the second SoCon team to face the Razorbacks this season (Samford on Feb.9). Arkansas is 3-2 against SoCon teams in program history.